Honey biscuits are sweet, flaky, buttery, and so so good. They are insanely easy to whip together and are probably a thousand times better than the canned stuff. 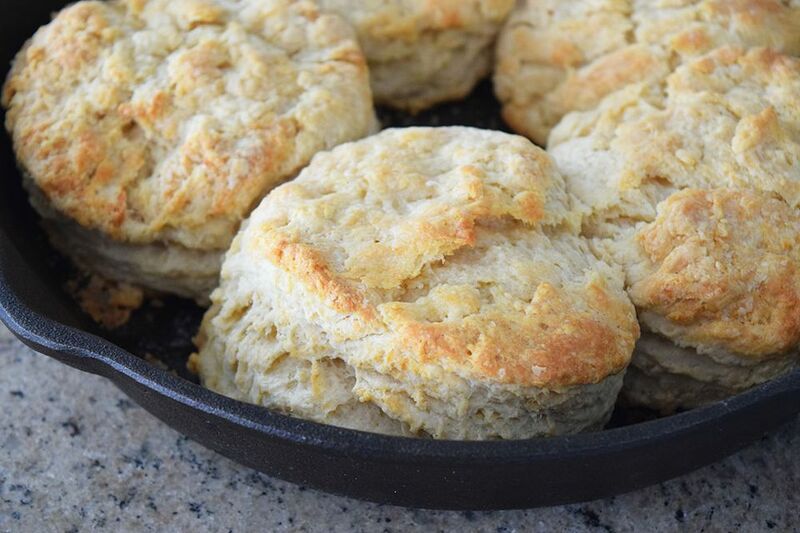 When you pull these hot biscuits out of the oven, everyone will be clamoring for the first one out of the pan. Pry them open and slather and an extra helping of butter all over their warm insides. In this recipe, I call for buttermilk, but you don't have to use buttermilk. Mixing a little vinegar in with some regular whole milk mimics the texture and flavor of regular buttermilk. It's not perfect, but it works great in a pinch, and yields nearly flawless results. You can serve these honey biscuits with sausage, berry butter, or some nice warm bacon and eggs. I love to make them into breakfast sandwiches with eggs, cheese, and bacon! You can easily alter this recipe to create other delicious biscuits. Leave out the honey and add in savory ingredients like shredded cheddar and chives for incredible savory biscuits. A food processor makes this recipe a lot easier to execute, but if you don't have one, you can use a pastry blender or two knives. If you are using two knives, make sure they are butter knives. Hold one in each hand and slice through the butter and flour, breaking up the butter. Try not to use your hand in the mixture at all. Your hands will heat up the butter and then the biscuits won't have the delicious pockets of butter after they are baked. Combine all dry ingredients and butter in food processor, pulse until it forms large crumbs. If you don't have a food processor, just use a pastry blender, or use two knives, cutting through the mixture until it forms smaller crumbs. Add buttermilk and honey into the food processor, gently combine until mixed. Turn the dough out onto a clean, floured surface. Roll out into a thick sheet, about 1/2 inch thick. Cut using a biscuit cutter and place into a butter cast iron skillet (you made need two, or to cook some on an ungreased cookie sheet). Brush the tops of the biscuits with some of the melted butter. Bake for 15 minutes, until golden brown. Brush with more melted butter and serve!